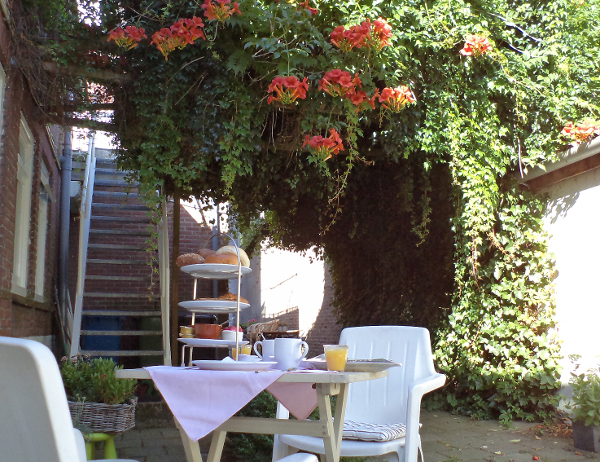 Bed & Breakfast De Kunstpraktijk in Veldhoven offers you with pleasure a Bed & Breakfast service. The guestrooms / apartments are both well equipped and have their own modern bathroom and kitchen and their own entrance. Free WIFI. In the morning you can enjoy a first class breakfast. The upstairs guestroom is, because of its size, available for a longer period. And would you like to stay over in an artwork? Well, that is possible! In turns the guestroom downstairs is decorated by another artist. De Kunstpraktijk is situated close to Eindhoven City, Eindhoven Airport and PSV-stadion. You will find Conference Centre Koningshof around the corner. ASML Head Quarters and Maxima Medisch Centrum as well. Furthermore, there are a lot of recreation facilities in the neighborhood such as the Van Abbe Museum in Eindhoven. You can play golf, go for swim or canoe ride, or take a bike tour through forests and meadows nearby. Also, there is a nice shopping street with lots of shops and planty excellent restaurants. Last but not least, there is free parking across the street.